Distributed generation of electricity, heating and cooling for buildings from solar radiation can have a large impact on the path to a renewable energy future. Constraints on cost, efficiency, energy storage, reliability, materials, scalability and complexity have so-far prevented widespread adoption of solar energy technologies. A small (5-50 kWe) concentrated solar power (CSP) system based on the Organic Rankine Cycle (ORC) concept features unique advantages: its average electrical efficiency could be very high (≈20%), and in addition it would allow for thermal energy storage, together with cogeneration of heating and cooling. This system would boast an unparalleled total conversion efficiency (up to 95%), and a high utilization factor throughout the year, which would put it well above competing technologies. ORC turbogenerators of this size are not on the market, and miniaturization involves a number of challenges related to the turbine: highly supersonic and very small volumetric flow, very high expansion ratio, need to limit secondary losses, strong dense-gas effects. Our studies highlight possible solutions to the above-mentioned difficulties. ORCHID (Organic Rankine Cycle Hybrid Integrated Device Test Rig) will be a closed circuit steady state test bench with the flexibility to easily interchange the test sections. The experimental rig is designed to have 250 kW maximum electrical capacity and allows for testing a wide variety operating conditions. It will be therefore used to conduct experiments on several small-scale turbine designs. 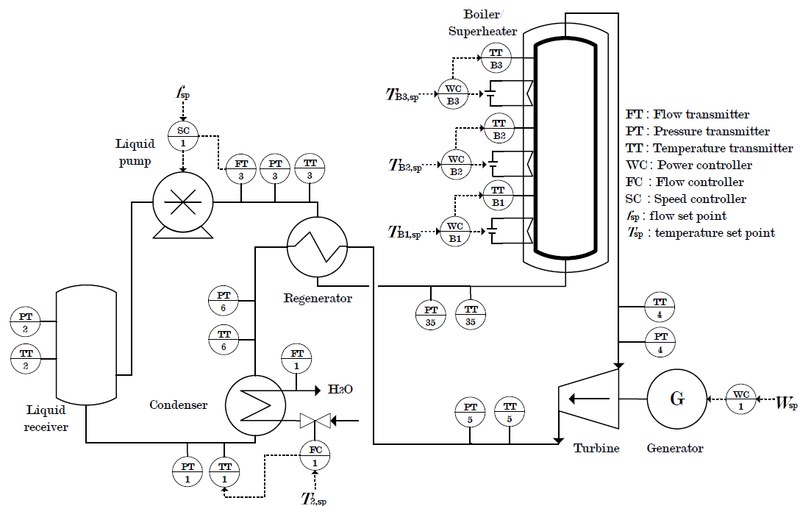 The system performance will benefit from new cycle configurations integrating thermal storage. Additionally, the working fluid, a key optimization parameter of the system, will be selected from innovative fluids and their mixtures. The results of the test will be also used to further develop our specialized suite of computational fluid properties. The main deliverables are 1) a proof-of-concept turbine prototype, and related measurements, 2) an optimal working fluid, 3) a validated software environment for the development of a virtual prototype, a unique and innovative tool for mini-ORC turbogerators design.